When you want something more flavorful than water to quench your thirst, and you’d like to keep it healthful, on an ordinary day it does the trick to just plop a few sliced berries, citrus wedges or chunks of melon into your water bottle with a sprig of mint. But for occasions such as holiday weekend gatherings that call for something more elevated, this beautiful blush beverage is the answer. It takes a little more effort than a basic infused water, but the look and taste of it is well worth it. First you make a fresh herb tea by crushing and steeping basil leaves in boiling water. Then you puree chunks of watermelon in a blender, and strain the puree to extract the vibrant pink juice. The watermelon liquid and the basil tea are then combined in a pitcher with a brightening touch of lime juice. The drink is delicious just like that, but it is more of a punch that way (which, I suspect, would be darn good spiked with some gin). To make it a super-quenching, low-calorie flavored water, you dilute it further with more fresh water. I suggest adding two more cups of water and serving it over ice, but you can dilute it as much or as little as you like. Once you get the basic formula down, you can play with the fruit and herb combinations; berries, cherries or grapes along with sage, mint or rosemary all work well to make this fresh take on a refreshing drink. MAKE AHEAD: The mixture can be refrigerated up to 2 days in advance; re-stir before serving. Ingredients:½ cup packed fresh basil leaves, plus some small leaves, for garnish1 cup boiling water4 cups cubed, seeded or seedless watermelon (1 pound)4 cups cold water2 teaspoons fresh lime juice, plus thinly sliced wheels or half-moon slices of lime, for garnishMethod:Place the ½ cup of basil leaves in a small pot or heatproof mug and pour the cup of boiling water over them. Use a muddler or the handle of a wooden spoon to crush the basil leaves. Let steep and cool for 15 minutes. Meanwhile, combine the watermelon and 2 cups of the cold water in a blender; puree until smooth. Strain through a fine-mesh strainer into a large pitcher, and discard the solids. Strain/discard the basil leaves from their water, then add that liquid to the pitcher, along with the remaining 2 cups of cold water and the lime juice, stirring to incorporate. 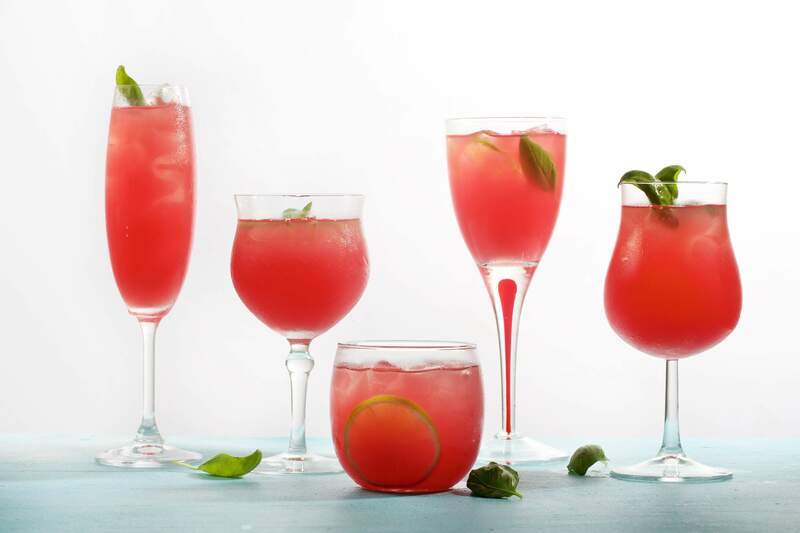 Serve over ice, garnishing each portion with basil leaves and lime slices. Source: From nutritionist and cookbook author Ellie Krieger.